War bonds men together. War tears them apart, quite literally for the fatally unfortunate; emotionally and psychologically for many who survive. 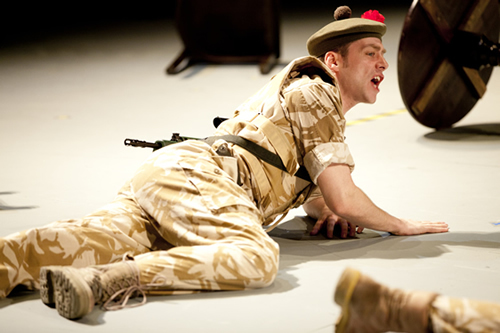 The acclaimed “Black Watch” from the National Theatre of Scotland is the story of survivors, and it is a powerful one. Writer (he refuses to be called “playwright” as he took his script from the testimony of the soldiers themselves) Gregory Burke has crafted a theatrical entertainment from the most grisly of subjects, the Iraq “peacekeeping mission.” And highly entertaining it is, with songs, bagpipes and lots of humor – most of it the gallows variety – peppered with a wealth of four-letter expletives that would make David Mamet blush. But behind the humor are the fear, boredom and pent-up rage that men in close quarters, doing a dirty job, are prey to. And something else: pride and loyalty – to the regiment, their country and each other. When you peel away the funny stuff and the blasts of explosives that punctuate this piece what you are left with is that pride. The action toggles back and forth between a pub, where the discharged members of Scotland’s esteemed Black Watch regiment are being interviewed by a writer (Robert Jack, who also plays the hard-nosed sergeant of the troupe) about their experiences in Iraq and Camp Dogwood, where the experiences actually took place. The Scots have been sent in to support the Americans in the area around Babil, known as the “Triangle of Death.” At home, all kind of politics rage around the subject of the war in general and the use of this elite cadre in particular. (The debate is shown on giant screens flanking the stage, as well as strategically placed television monitors). To top things off, a plan has been drawn up, consolidating the Scottish troops into one unit, effectively erasing the identity of the Black Watch after some 230 years of exceptional service. Enter the “Golden Thread,” the link that has held the tradition of this regiment together for almost three centuries, since its founding to mitigate the feuding of the Highland clans, through conflicts in Ireland, America, the Napoleonic Wars, Crimea, both World Wars, Korea and a series of peacekeeping missions from Kenya to Cyprus to Hong Kong. The traditional tartan, the vulture feather worn in the cap and the legendary sword of Robert the Bruce, winner of Scot independence, all are woven together by the Golden Thread. These are proud men and they have a long history to be proud of. But they are not proud of what they are doing in Iraq. Those that are left will not re-enlist. A crackerjack ensemble is led by Stuart Martin as Cammy, the most reasonable of the veterans and the first to volunteer to tell his tale. But they all are exceptional, and the actors manage to make each a distinctive personality in a very short time. There are the goof-offs, the hotheads and the lifers, the last beautifully played by Stephen McCole as the commanding officer “cursed” with a family history intertwined with the Black Watch. There is a moving scene where the men get letters from home, reacting with strange and private hand gestures to what they read (movement directed by Steven Hoggett). But the most affecting scene of all is a final march, like a choreographed ballet, where the men march ahead and turn back and, when one falls, someone picks him up and they begin again. It is a kind of metaphor for a senseless war. They rush around furiously and get nowhere. But they are there for one another and that’s what it is about for these guys. Earlier in the play, when the Writer asks them why they do it, one replies, “For my regiment,” another, “For my platoon,” a third, “for my section,” and the last, “for my mates.” And that’s what you take away.